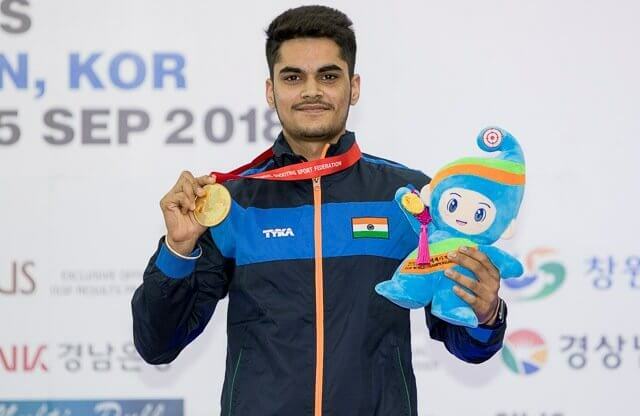 Arjun Cheema wins Gold in Junior Men's 50m Pistol at ISSF World Championship. 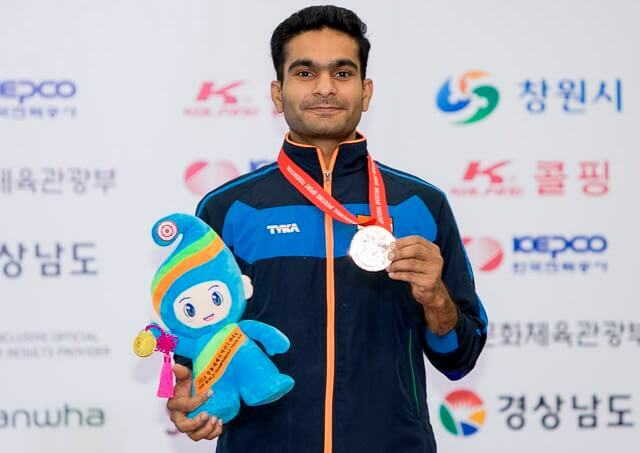 Arjun Cheema and Gaurav Rana won the gold and bronze medals respectively in the junior men’s 50m pistol on the opening day of the 52nd ISSF World Championship in Changwon, Korea. The 17-year-old Arjun shot a personal best score of 559/600 to claim the title with a clear margin of five points. The silver was won by Korea’s Woojong Kim with 554 while Gaurav shot 551 to bag the bronze. The third Indian in the fray, Anmol Jain shot 549 to finish 5th. 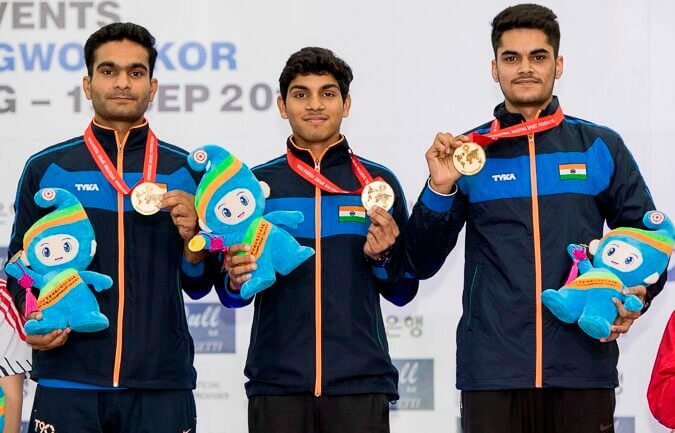 The Indian trio of Arjun, Gaurav and Anmol also won the team gold with 1659/1800 ahead of Korea who came second with 1640. China won the bronze with 1627. Gaurav Rana wins Bronze in Junior Men’s 50m Pistol. Arjun has been in scintillating form this year. 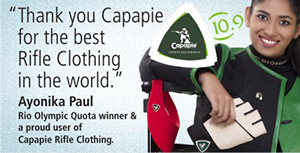 He helped India to team gold medals during the ISSF Junior World Cups held in Suhl and Sydney, earlier this year. Arjun has also represented the county in a junior swimming competition in Austria in 2014. Seeing little scope of progress in swimming in the country, Arjun gave up the sport and turned to shooting in 2015. Asian Games bronze medallists in 10m air rifle mixed team, Apurvi Chandela and Ravi Kumar shot 836.6 to finish 7th, missing the final by a mere margin of 0.4 point. From left: Gaurav Rana, Anmol Jain & Arjun Cheema win Gold in Junior Men’s 50m Pistol Team. The other Indian pair of Mehuli Ghosh and Deepak Kumar registered 831.6 to finish 25th in a field of 70 teams. The World record holders Zhao Ruozhu and Yang Haoran of China asserted their class by winning the event ahead of another Chinese pair, after having topped qualification with 840.5. By pushing Russia, Romania and Germany to the third to fifth spots in the final, the Chinese swept both the Olympic quota places in the event. In mixed air pistol, Heena Sidhu and Shahzar Rizvi shot 768 and missed the final by three points. 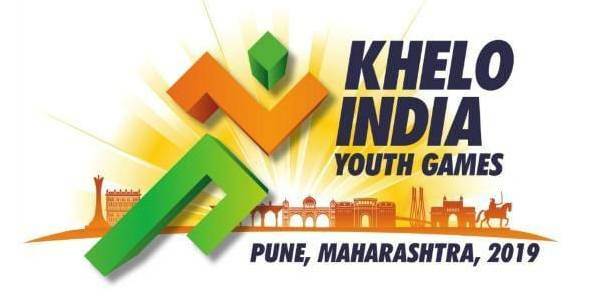 The other Indian pair of Manu Bhaker and Abhishek Verma had a total of 767 for the 12th spot in a field of 62 teams. Junior Men’s 50m Pistol: 1. Arjun Singh Cheema (India) 559; 2. Woojong Kim (Korea) 554; 3. Gaurav Rana (India) 551; 5. Anmol Jain (India) 549. Junior Men’s 50m Pistol Team: 1. India (1659); 2. Korea (1640); 3. China (1627). 10m Air Rifle Mixed Team: 1. China-2 (Zhao Ruozhu, Yang Haoran) 500.9 (840.5); 2. China (Wu Mingyang, Song Buhan) 500.6 (836.5); 3. Russia (Anastasia Galashina, Vladimir Maslennikov) 434.2 (836.0); 7. India (Apurvi Chandela, Ravi Kumar) 836.6; 25. India-2 (Mehuli Ghosh, Deepak Kumar) 831.6. 10m Air Pistol Mixed Team: 1. Russia (Vitalina Batsarashkina, Artem Chernousov) 488.1 (772); 2. China-2 (Wang Qian, Wang Meng Yi) 480.2 (771); 3. Ukraine-2 (Olena Kostevych, Oleh Omelchuk) 416.7 (775); 10. India-2 (Heena Sidhu, Shahzar Rizvi) 768; 12. India (Manu Bhaker, Abhishek Verma) 767.